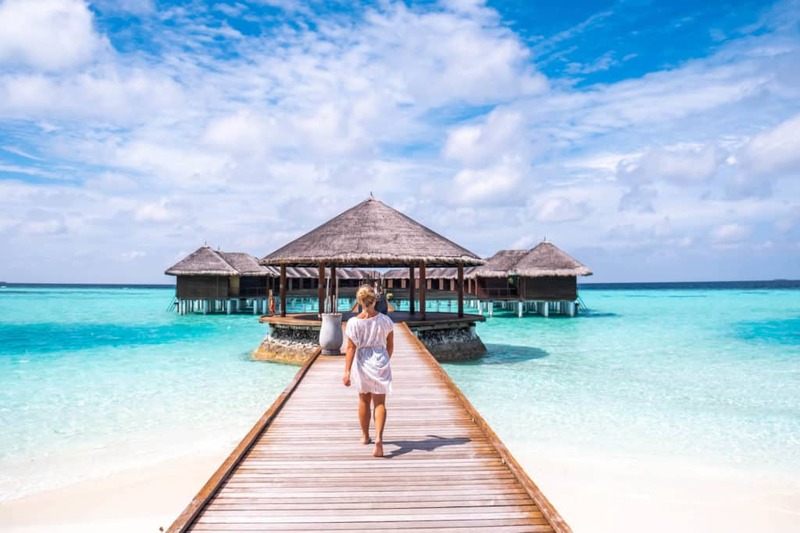 Looking for the ultimate Maldives packing list? We just spend an incredible two weeks in the country and decided we were moving there! Just kidding (but really who wants to loan us an island?). In case you are wondering what to wear in the Maldives like I was before arriving, don’t worry. The Maldives are incredibly laid back and a part of the world where a pair of flip flops and sunscreen go a long way. However, just in case you need some guidance I wanted to write this Maldives packing list to help. The best time to travel to the Maldives is from November and April. High season really picks up in December and is pretty crazy until March. Monsoon season runs from May to October. The weather in the Maldives is pretty much perfect. Not too humid and not cold. You’ll be comfortable wearing your swimsuit and cover-up around during the day and a dress or beach clothes at night. The Maldives is a dream destination, but it does still see rain. Many resorts and hotels will provide you with an umbrella but it never hurts to have a rain jacket. A few of the Maldivian islands have great surf. If you’re a surfer remember your surf essentials. The Maldives is also one of the best places in the world to go diving. If you have a BCD, regulator, mask, fins and all the other essentials it could be worth bringing it with you. Dive shops will charge you more to rent their equipment. Please be conscious of the environment when applying sunscreen. Over-the-counter sunscreens containing harmful chemicals that are harmful to marine life. Respect the environment you are going to enjoy for vacation and only wear reef safe sunscreen in the ocean. No resorts in the Maldives are going to provide you with sunscreen and will charge a premium to purchase at their gift shop so make sure to bring yours from home. No joke – we saw one places charging $60 for a bottle of Sunbum! We personally choose eco-friendly sunscreen when we are going into the ocean so that we don’t release chemicals into the environment. This is the exact kind we traveled with to The Maldives. If you’re packing for The Maldives in a carry on considering at least bringing a travel sized bottle with you. Flip-flops are never a bad idea at beach destinations and should be on every traveler’s Maldives packing list. My favorite brand is Rainbow Sandals as they last forever and are super comfortable once the leather forms to your foot. 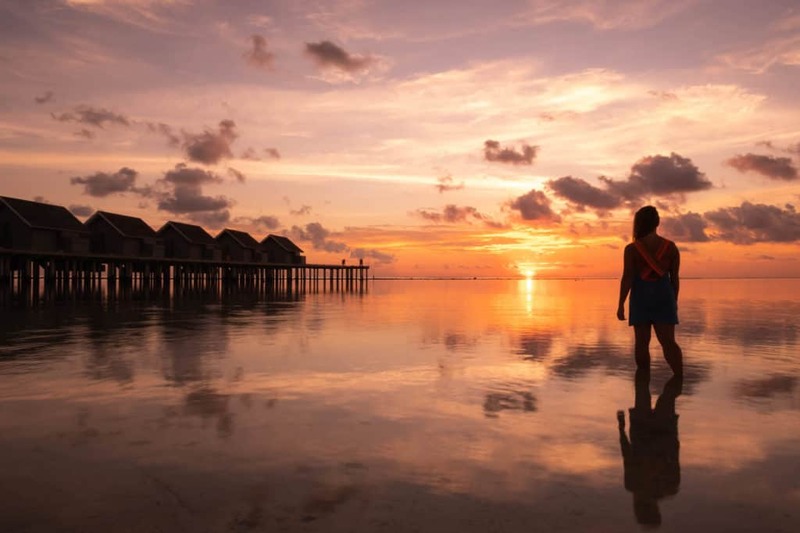 Obviously, you’re going to need a bathing suit for your Maldives trip. You’ll likely be spending most of your time outside in the sun or underwater so a few bathing suits are essential. When I travel I always bring at least two suits so that I have a dry one to always change into. I personally brought eight bathing suits for this particular trip and went photo crazy in all of them. Cam was set with two pairs of swim trunks! I typically always have at least two pairs of yoga pants in my suitcase and being in the Maldives was no exception. Yoga on the beach, on your back porch, or on your ooverwater bungalow will make your days that much better! 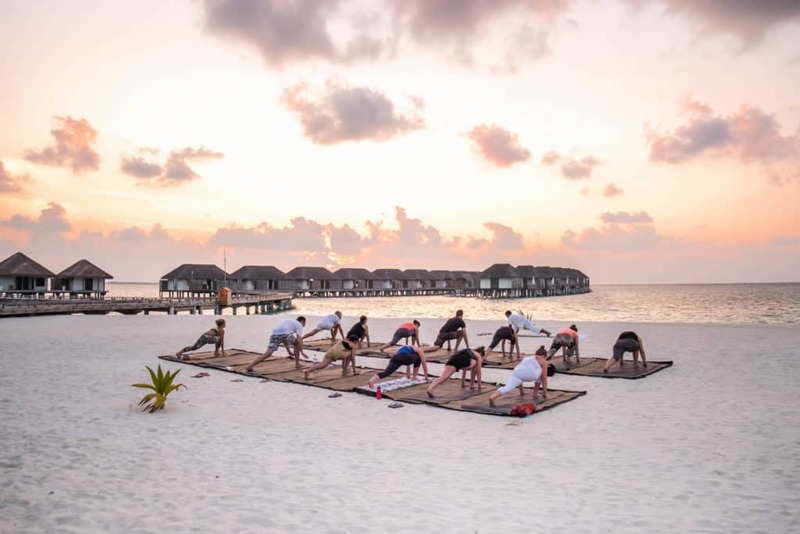 Some places even have free sunset or sunrise yoga sessions at their gyms. My favorite yoga pants are made by Yoga Democracy. They come in really fun designs and are made from recycled fishnets. You aren’t going to get Instagram famous in the Maldives without a big floppy sunhat! Seriously, I think every girl I saw had a sunhat and I was jealous I didn’t have one. Don’t be me and just bring one for your trip. Dry bags are great if you’re going to spend time at the beach or find yourself out on a boat. They will protect your phone and any other electronics from the ocean, or more importantly if it starts to rain. We found them really important when we went out on our diving trips. A beach cover-up or sarong is essential when traveling to The Maldives. Most of my cover-ups come from Pitusa. Pitusa only uses Peruvian and Indian cotton and employs women from Peru, Bali, and India to make the products. As a fan of fair trade that these are made in ethical work environments. These Pitusa dresses are also so beautiful they double as a night out dress (but are sheer so wear something underneath). 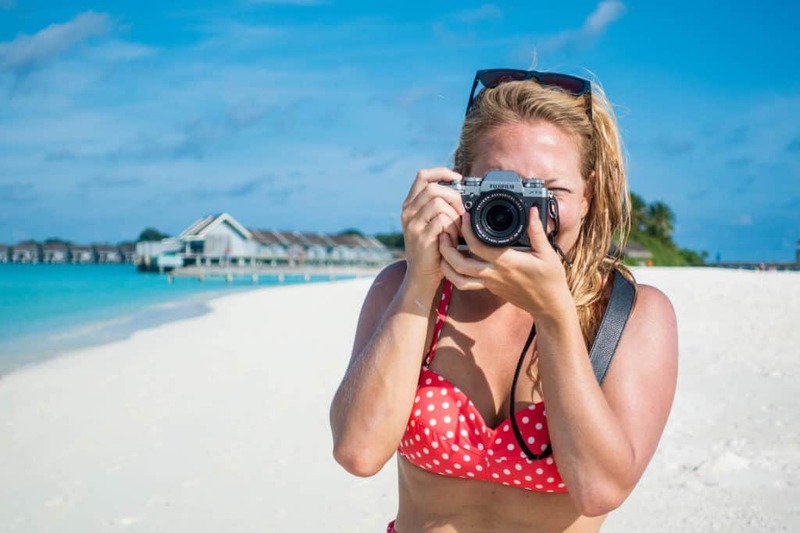 Chances are you’ll want a camera for your trip to The Maldives. Our favorite pocket-sized point and shoot camera for quick trips are the Sony RX100V. It takes fantastic photos and video and is the size of your palm. We bought this camera specifically for our trip to Hawaii earlier as year as we could easily add on underwater housing for an affordable price. It came in handy when we were snorkeling with sea turtles, black tipped reef sharks, mantas, and sting rays in the Maldives. Check out our other travel cameras here. We like to throw a GoPro Hero 7 on our beach packing list since they are waterproof. Just make sure to attach it to a wrist strap so it doesn’t get lost! The Indian Ocean may or may not have swallowed one of our cameras before. You can always consider a floaty case to help loss prevention. alternative to the GoPro. No matter what you will need a beach bag when heading to beach destinations. This is to throw in anything from towels to books, to sunscreen. Depending on the size of your beach party you may only need one medium sized tube. For family beach goers I recommend a large yet durable beach tote like this one. Many resorts will provide you with a beach bag, but we found them quite small and not durable. The Maldives are as casual or formal as you want them to be. There is no one style fits all and everyone does something different every night. For those wanting to dress up, you’ll have the opportunity every night at dinner. Women should consider bringing at least a few light and flowy dresses or rompers while men should have a casual beach outfit to wear out. Check out some of the best sellers right now and pick up a copy. I like to read on days when I just feel like sunbathing and relaxing, which was every day in the Maldives. Cameron is pretty impatient so having a book to read on the beach provides some much needed an entertainment. I’ve recently upgraded to the Kindle Paperwhite and absolutely love it. It’s small, has touchscreen functions, and a backlight so that I can read at night without a harsh glare. Make sure to protect your eyes from the sun on your Maldives trip! You are close the equator and the sun is harsh! I personally can’t even go outside without sunglasses. If you are a snorkel lover like us it might be worth it to you to bring fins. Would you believe we travel around the world with our fins, mask, and a snorkel? It’s true! We were a little surprised that despite already paying an arm and a leg in the Maldives the resorts will still charge you to rent snorkel equipment each day. The cost may be as little as $5 a day, but having our own gear saves us the hassle of dealing with rentals, paying, and putting our mouths around used snorkles. I have an Aqualung mask that works great and Dive Oceanic fins that fit well in my suitcase. Just because you’re going to one of the worlds dreamiest beach destinations doesn’t mean you shouldn’t stay active. If you don’t want to abandon the work our routine bring your sneakers so you can still keep up with the beach bod. See more of the best women’s travel shoes here and men’s travel shoes here. 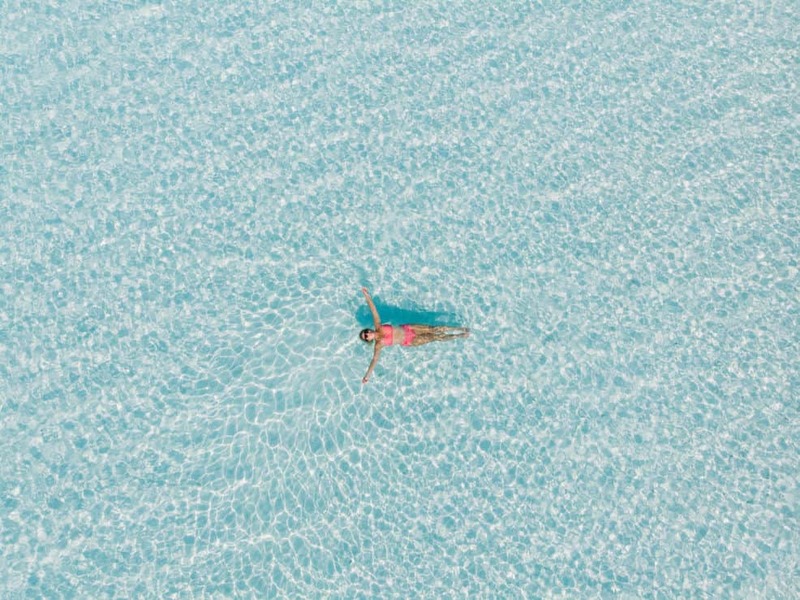 You’re not anyone on Instagram until you take a photo with a bright pink flamingo floaty in the baby blue water of the Maldives. Nowadays you get anything from Unicorn floaties to giant parrots to float in the water with. These floaties were all over the Maldives. You can buy them at resort gift shops, but you’ll get a better deal online beforehand and packing it with you. We never travel without travel insurance. You never know what can happen when you travel and it’s better to be safe than sorry. Especially if you’re partaking in water based activities like scuba diving or snorkeling. You’ll want to be covered. We recommend World Nomads for short-term policies. The Maldives uses the British, Type G adaptor. A universal adaptor is never a bad idea when you’re traveling, so make sure you find a good one like the one I have to keep you charged. Where to stay in the Maldives? Budget: Cinnamon Ellaidhoo is a great property for those that want to do the Maldivian resort thing while still staying on budget. We were at Ellaidhoo for three nights and loved our time here. The house reef is simply amazing and every time we went out to snorkel we discovered some new, bright fish. It’s also very far away from Male and the hustle and bustle of the countries capital. Check prices here! Mid Range: We had a fantastic time at Kurumba Maldives. 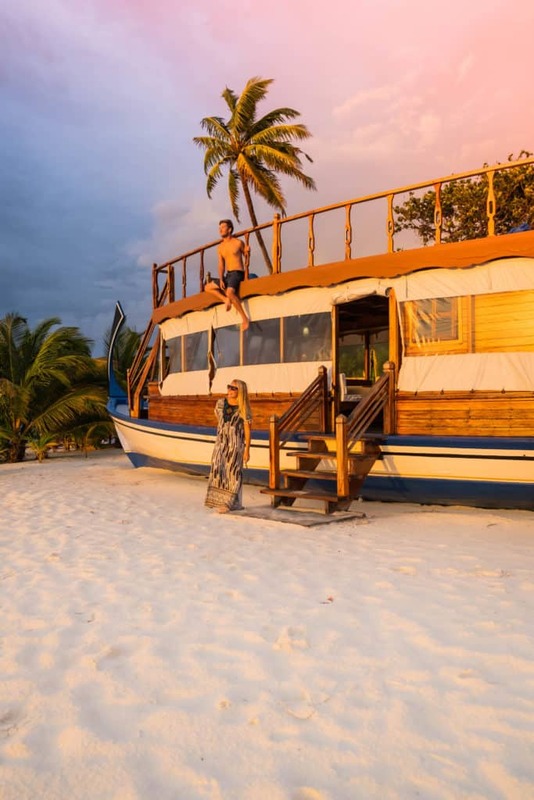 This resort is only a five-minute speedboat ride away from the Male Airport. Meaning you could arrive in the Maldives and be at your resort a few minutes later, saving on additional airfare and time. It’s also the first resort ever in the Maldives, but it’s elegantly maintained and they have a great dive shop. Check prices here! 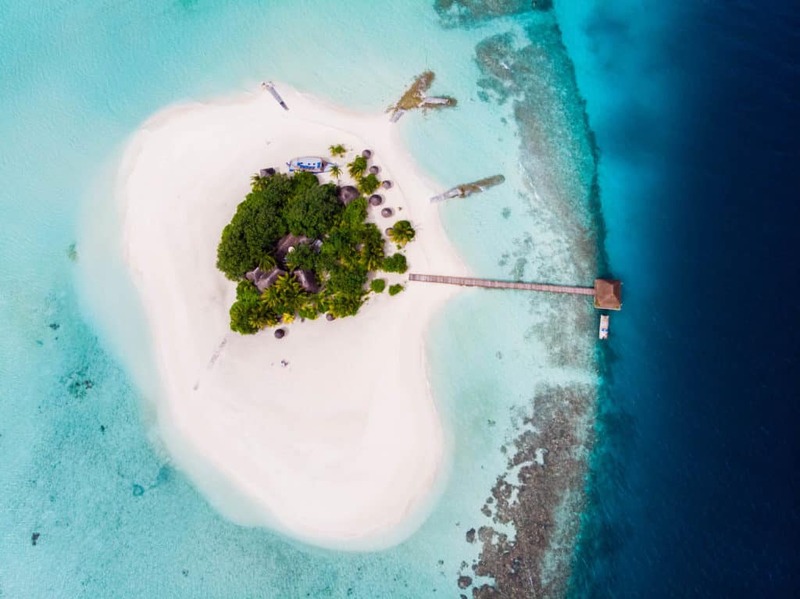 Luxury: Velassaru was our favorite resort in the Maldives. They are a 20-minute speedboat ride away from the capital so it’s a quick transfer in and out. The food here is to die for and the overwater bungalows are bigger than my entire old apartment. You won’t regret a stay here! Check prices on Agoda. Hey, we’re Cameron and Natasha — We’re the head writers and creators of The World Pursuit. Over the last five years, we’ve traveled around the world. Let us send you some great tips and inspiration straight to your inbox every month.